Over the years I've enjoyed replicating commercially made products. Growing up, one of my favorite frozen confections was Frozen Fudge Pops. I just loved their deep chocolate flavor and velvety smooth texture. But how do you make them at home? The first thing I thought about was how similar in taste and texture a Frozen Fudge Pop is to a chocolate pudding. Which led me to the idea of just making my chocolate pudding recipe and then freezing it in individual molds. It is what I like to call "a frozen Chocolate Pudding on a stick". I was really happy with the results. Actually I think they taste better than the commercial product. Now, I did make a few changes to my chocolate pudding recipe. First, I made it eggless and I also reduced the sugar, but otherwise the recipe is the same. This chocolate pudding could be called a "double" chocolate pudding, as it gets its deep chocolate flavor from both unsweetened cocoa powder (regular or Dutch-processed) and semisweet (or bittersweet) chocolate. Of course, the type and brand of unsweetened cocoa powder and the chocolate you use will determine the flavor of your Fudge Pops. When you make a chocolate pudding what you are really doing is making a 'cooked' custard that contains cornstarch to make it nice and thick. The danger zone with any pudding is cooking it over too high a heat causing lumps or even worse, scorching. To avoid these pitfalls use a heavy bottomed saucepan and cook it over medium low heat, stirring constantly with a large heatproof rubber spatula. Make sure when stirring you reach the bottom, sides and corners of the saucepan to prevent the pudding from sticking and scorching. As you cook the pudding it may look lumpy but if you stir quickly the lumps should smooth out. Once the pudding has become thick, like mayonnaise, remove immediately from the heat. If you do have lumps, simply strain the pudding. 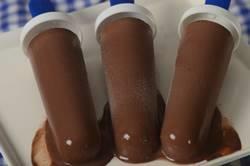 Frozen Fudge Pops: In a medium-sized saucepan, whisk together the sugar, cornstarch, cocoa powder, and salt. Whisking constantly, slowly add about 1/3 cup (80 ml) of the milk until you have a thick paste. Then whisk in the remaining milk, cream, and chopped chocolate. Place over medium heat and bring just to a simmer. Cook, stirring constantly, until the mixture thickens to the consistency of mayonnaise (about 2 minutes). Remove from heat and add the vanilla extract and butter, stirring gently with a rubber spatula until the mixture is smooth. Pour into 4 popsicle molds and freeze for about four hours (or overnight) or until frozen. Makes four Frozen Fudge Pops (each 1/3 cup (80 ml)). Note: This recipe can be doubled to make eight Frozen Fudge Pops.